It's just after 7 and the sun is coming up. 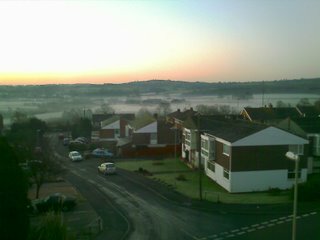 I looked out of the window to see a wonderful view across the hills, with a mixture of valley fog and frost. It's a shame that my mobile phone camera can't do it justice, and I don't have time to take a proper picture. Back to getting ready for work, already behind schedule!